For those familiar with Yammer and Office 365 Sharepoint this question may be a familiar one. For those currently using one or the other or considering adopting them, it’s important to understand that this is an important question when considering implementation of social collaboration for the Enterprise. Yammer provides a social network for the Enterprise. Best put, it feels like a bit of a merging of the traditional forum concept (groups) with hints of Twitter and LinkedIn (posts, feeds, likes). It’s a great way to get people talking inside the company about both business and social matters in a monitored way, without a lot of overhead trying to curate content. Office 365 Sharepoint (Sharepoint 2013 Online) sought to jump forward on the social collaboration front with a number of features including Communities, Newsfeeds, content sharing and Following. For the most part the features work but require a fair amount of study, configuration, and maintenance to operate well. Yammer provides many of the same features in an easier to manage model, but not without some sacrifices in controlling content (Yammer tends to encourage a lot of unstructured content and collaboration). Microsoft has provided indications that the future of social collaboration in Sharepoint will be closely intertwined with the future of Yammer and has begun a phased integration of Yammer into Office 365. About 18 months ago we began implementation of Office 365 Sharepoint and were faced with a decision of whether to adopt Yammer as well. 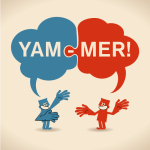 We ended up purchasing Yammer for the company and rolled it out primarily for ad hoc use. As our implementation of Sharepoint grew we began to bump into areas where we wondered whether Yammer or Sharepoint features would be the best approach (i.e. handling of technical knowledgebases). Our initial pilot focused on using a Sharepoint Community site which had the benefit of a strongly defined structure (Categories) and integration into Sharepoint search. However, we found a lack of enthusiasm for participation and identified that the level of effort to properly set up Newsfeeds and other features would be substantial. We decided to take a step back and evaluate our options. Unfortunately, the question of whether to use Yammer for Sharepoint social collaboration is not an easy one. One thing was clear, that it’s important to decide one way or another and focus efforts in the right place. Adopting Yammer and using Sharepoint collaboration for things that could be done in Yammer will confuse users with where to find content and where to socialize one type of information or another. In the end, we realized that we had to make a strong statement one way or another and either go all in for Yammer or abandon it for the time being. In the end we decided to quickly form a Yammer group and vote. The MCFTech team can help you optimize your Sharepoint. or complete our Contact Form and we will get back to you right away.